Stratasys Ltd. (Nasdaq:SSYS) a leading global provider of 3D printing and additive manufacturing solutions, is introducing the Objet260 Dental Selection 3D Printer at the International Dental Show this week in Cologne, Germany. Leveraging Stratasys’ unique triple-jetting technology, the Objet260 Dental Selection raises the bar in 3D printed dental model realism to improve the accuracy and efficacy of digital dentistry. The versatile new 3D printer is designed to help mid- to large-sized dental and orthodontic labs grow their business by producing realistic models with true-to-life look and feel as part of their end-to-end digital dentistry workflow, including intra-oral scanners. Its ability to build diverse models with multiple materials on one tray, in one print job, increases productivity which can further improve profitability. Pivotal to the capabilities of the Objet260 Dental Selection is the ability to enable dental and orthodontic labs to enjoy unprecedented realism of the stone models. This permits the production of life-like gum textures for precise functional testing, as well as a wide range of shades for customized, color matching. The Objet260 Dental Selection 3D Printer is compatible with all PolyJet dental materials, plus an array of dental-specific material palettes to produce life-like colors and textures for teeth and gums. This allows users to serve a broader range of dental applications with a single system, reducing equipment costs. 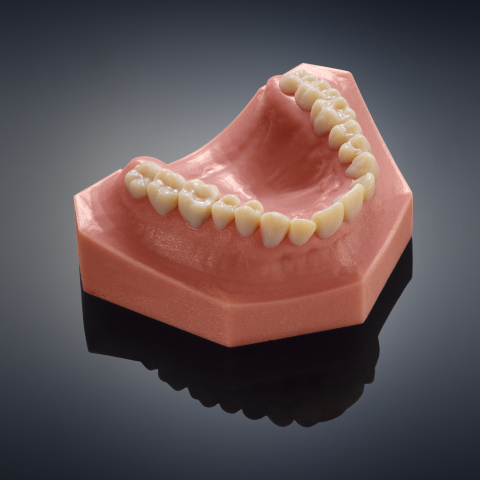 These usages span implant testing with stone models that mimic the look and feel of real gingiva for accurate functional evaluation, as well as models with rigid features that require gum-like materials. Labs can print surgical guides directly from CBCT scan data, with high-definition tooth, root and nerve-canal anatomy rendered in contrasting materials to help prevent dental nerve injury. For more information about the Objet260 Dental Selection 3D Printer, contact a reseller or visit the Stratasys website. Images and a spec sheet are available by visiting the Stratasys newsroom. The statements in this press release relating to Stratasys’ beliefs regarding the benefits consumers will experience from the Objet260 Dental Selection 3D Printer, Stratasys’ expectation on the timing of shipping the Objet260 Dental Selection 3D Printer are forward-looking statements reflecting management’s current expectations and beliefs. These forward-looking statements are based on current information that is, by its nature, subject to rapid and even abrupt change. Due to risks and uncertainties associated with Stratasys’ business, actual results could differ materially from those projected or implied by these forward-looking statements. These risks and uncertainties include, but are not limited to: the risk that consumers will not perceive the benefits of the Objet260 Dental Selection 3D Printer to be the same as Stratasys does; the risk that unforeseen technical difficulties will delay the shipping of the Objet260 Dental Selection 3D Printer; and other risk factors set forth under the caption “Risk Factors” in Stratasys’ most recent Annual Report on Form 20-F, filed with the Securities and Exchange Commission (SEC) on March 3, 2015. Stratasys is under no obligation (and expressly disclaims any obligation) to update or alter its forward-looking statements, whether as a result of new information, future events or otherwise, except as otherwise required by the rules and regulations of the SEC. Stratasys and Objet are registered trademarks, and PolyJet and Objet260 Dental Selection are trademarks of Stratasys Ltd. and/or its subsidiaries or affiliates. All other trademarks are the property of their respective owners.